Citation Information: J Clin Invest. 2012;122(8):2928-2939. https://doi.org/10.1172/JCI58767. Embryonic stem cells (ESCs) represent a promising source of midbrain dopaminergic (DA) neurons for applications in Parkinson disease. However, ESC-based transplantation paradigms carry a risk of introducing inappropriate or tumorigenic cells. Cell purification before transplantation may alleviate these concerns and enable identification of the specific DA neuron stage most suitable for cell therapy. Here, we used 3 transgenic mouse ESC reporter lines to mark DA neurons at 3 stages of differentiation (early, middle, and late) following induction of differentiation using Hes5::GFP, Nurr1::GFP, and Pitx3::YFP transgenes, respectively. 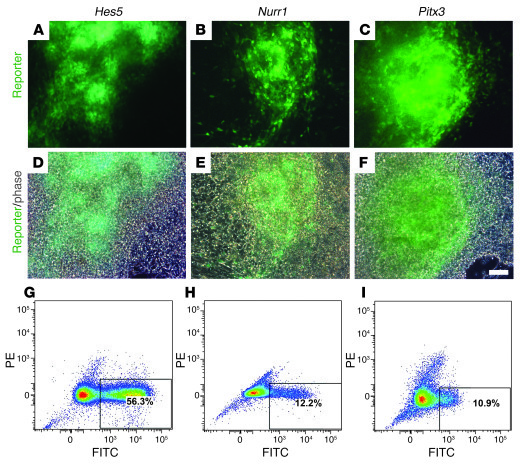 Transplantation of FACS-purified cells from each line resulted in DA neuron engraftment, with the mid-stage and late-stage neuron grafts being composed almost exclusively of midbrain DA neurons. Mid-stage neuron cell grafts had the greatest amount of DA neuron survival and robustly induced recovery of motor deficits in hemiparkinsonian mice. Our data suggest that the Nurr1+ stage (middle stage) of neuronal differentiation is particularly suitable for grafting ESC-derived DA neurons. Moreover, global transcriptome analysis of progeny from each of the ESC reporter lines revealed expression of known midbrain DA neuron genes and also uncovered previously uncharacterized midbrain genes. These data demonstrate remarkable fate specificity of ESC-derived DA neurons and outline a sequential stage-specific ESC reporter line paradigm for in vivo gene discovery. Characterization of reporter expression in the 3 BAC lines. (A–C) Live reporter expression on day 14 of differentiation. (D–F) Overlay of reporter expression and phase-contrast images. (G–I) FACS analysis for reporter expression at day 14 of differentiation plotted against PE and FITC channels. Numbers represent the percentage of positive cells. Scale bar: 50 μm.